Privately owned. Undergoing major overhaul. Built 1953 (John), 1957 (Ranald) and 1958 (Denis), Sentinel Ltd., Shrewsbury. 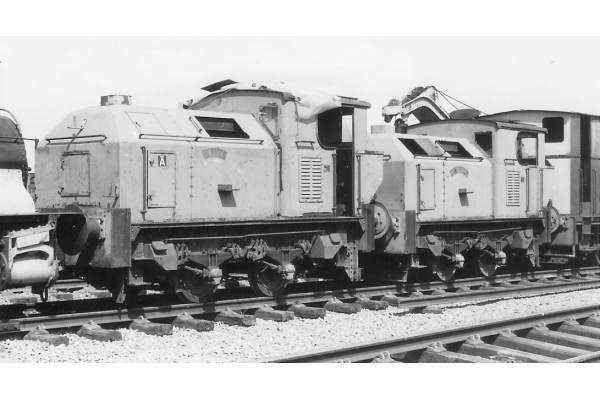 Works Nos.9627 (Ranald); 9631 (Denis); 9561 (John). The Sentinel company began as Alley & MacLellan, based in Polmadie, Glasgow in 1906, and moved to Shrewsbury in 1915. In 1917 the company was bought by William Beardmore & Co Ltd, and in 1920, after financial problems, was reorganized as Sentinel Waggon Works (1920) Ltd. Sentinel led the market for steam powered road vehicles in the 1920s and 30s. The company used the technology which it had developed for road vehicles to produce steam shunting locomotives. 'Ranald' and 'Denis' show the final development of Sentinel 'BE' type, and were operated by R.B.Tennant of Coatbridge, engineers and contractors to the Scottish steel industry, being taken out of traffic only in 1984. They have a vertical boiler and vertical cylinders. 'John' was initially used as a demonstration locomotive for R.B. Tennant, before being bought by them in 1960. Sentinel, by then owned by Rolls Royce, ceased steam locomotive production in 1958 and commenced building diesel shunting locomotives.